While shying away from using the word coupon, JC Penney’s recent delivery of a $10 “gift” to its email newsletter recipients demonstrated that the beleaguered department store was finally bending to what its customers have been asking for all along: a deal. Since the commencement of its “Fair & Square” promotional strategy in Q1 of 2012, JC Penney has been fighting a losing battle with its dwindling customer base, trying to spoon feed shoppers everyday low pricing like its ice cream, while in reality they were tasting [insert your least favorite veggie here]. What did JC Penney forget? 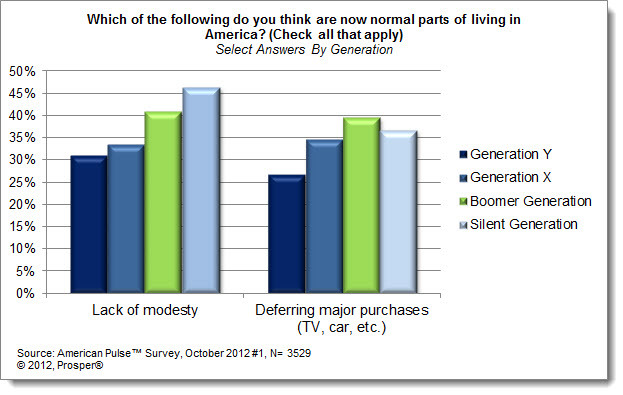 In this economy, consumers have the upper hand with retailers. With sales set in a tailspin during the first half of the year, it’s obvious that “Fair & Square” was a costly turnabout for both JC Penney and its customers. But what price did JC Penney pay in terms of lost shoppers? According to the Consumer Equity Index™ for the highly competitive women’s clothing segment, JC Penney’s share of female customers shrank 13% in the past year, leaving the department store with an index of 86.9 (baseline index = 100). * That equates to a loss of 1.3 million of the department store’s most loyal female women’s clothing shoppers. A million shoppers are a lot to lose in a year’s time – especially in just one category – but the numbers become even more sobering when you consider how much potential revenue JC Penney let slip from its grasp. With the average female spending more than $500 per year within the women’s clothing segment, an estimated $745 million in potential revenue has walked out of JC Penney’s women’s department over the past year – that’s a big share of purse, if you will. JC Penney’s $10 gift comes at a pivotal time for retailing: the all-important holiday season. And with shoppers continuing to be drawn to sales, coupons, and promotions like moths to a flame, JC Penney is likely to see a short-term increase in the foot traffic it so desperately needs. However, while the department store indicates that this “gift” does not signal their return to couponing, if they want repeat customers, they may have to keep the coupons gifts coming. * The Consumer Equity Index™ from BIGinsight™ is a year over year index showing growth or decline of consumer preference share. An index of 100 is flat, an index of 105 indicates 5% growth, while an index of 95 denotes 5% decline. With a record number of adults celebrating Halloween this year, it’s safe to say that this isn’t a holiday just for the kiddos anymore. Those of us 18+ dress in costume, attend parties, carve pumpkins, decorate our homes/ yards, and even force Fido to get in on the fun. Then there’s the candy. Oh, yes, the candy. Don’t we all get excited when the Halloween treats hit store shelves around Labor Day? I’ll cop to purchasing four bags of my “fun size” favorites last month. I justified this as shopping ahead for what was sure-to-be an onslaught of little trick-or-treaters on Beggar’s Night this year [side note: we had five last year]. But whether we have one, five, twenty, or fifty little ghosts and goblins, it won’t matter because that candy is gone. Yes, I had consumed four bags of Halloween candy in a matter of weeks. But we’re not alone in our sugar-high-inducing disgrace…right? As it turns out, we all have our favorite Halloween candies to treat to others – and to keep for ourselves. 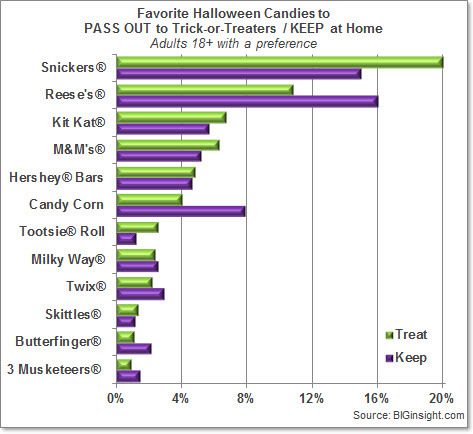 According to our October monthly survey of nearly 9,000 consumers, about one in five (20.1%) of those with a preference cite Snickers® as their favorite candy to pass out on Beggar’s Night, double the popularity of the next brand on their list, Reese’s® (10.8%) and consistent with last year’s findings. * Expect plenty of Kit Kat® Bars (6.7%), M&M’s® (6.3%), and Hershey® Bars (4.8%) among trick-or-treaters’ Halloween hauls this year as well. I tend to get a Halloween hankering for three bags worth of Reese’s® Pieces each year [loved them since E.T. #productplacementworks], and I’m glad to see that this craving is perfectly normal: when it comes to the candy that connoisseurs would prefer to keep at home, Reese’s® (16.1%) has a slight edge over Snicker’s® (15.1%), while Candy Corn (7.9%), Kit Kat® (5.7%), and M&M’s® (5.2%) follow. Although Halloween is still a week away, Beggar’s Night can’t come soon enough. There’s a bag of Milky Way® bars at my house about to become extinct. And, for Halloween data released earlier in the month by our friends at the National Retail Federation, including spending, activities, planned costumes, and a fabulous infographic, please click here. * Favorite candy brands to pass out to trick-or-treaters and to keep at home are the results of two unaided, write-in questions. 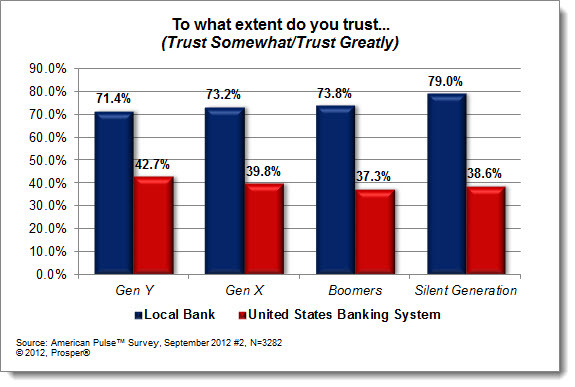 Percentages displayed in this report are based on consumers expressing a preference. 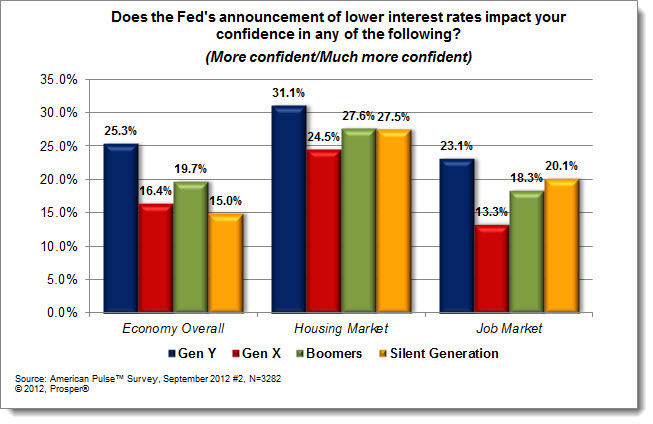 What do you get when you combine tenuous consumer confidence, discouraging employment outlook, and an upcoming Presidential election? 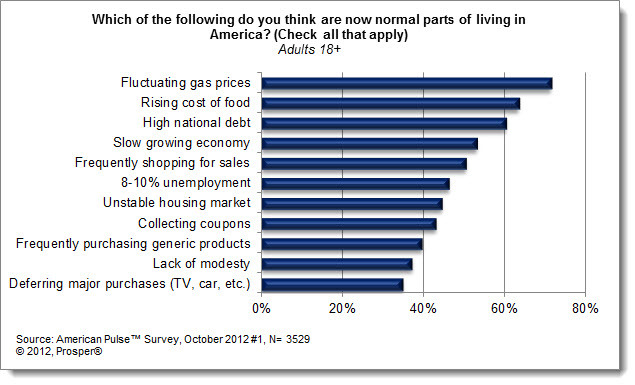 Economic uncertainty, which generally leads to consumers clamping down harder on their wallets. That’s not quite the case, though, with Halloween. Aside from fun, though, it seems that a growing number of consumers is viewing Halloween as having, well, a therapeutic benefit. 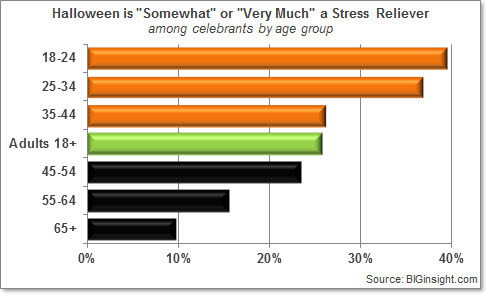 According to the latest insights from our October survey, one in four celebrants (25.6%) agreed that Halloween “somewhat” or “very much” a stress reliever, rising 20% from last year. And, that number grows substantially among the age groups most likely to don a costume or head to a party this year: 18-24 year olds (39.5%) and 25 to 34 year olds (36.8%), both up from a year ago. Interestingly, while the thought that Halloween relieves stress declines with age (see chart below), the number of 45 to 54 year olds adhering to this sentiment has risen 36% over a year ago – the highest growth in any age group. Perhaps it’s because this group – on the cusp of retirement and/or sending kids to college and/or worrying about property values and/or etc. – might be most in need of a little levity. My tip for a low-stress Halloween? Nix the raisins on Beggar’s Night. Passing out some sugar to the neighbor kids sure beats pulling endless amounts of toilet paper out of your trees the next morning.